Er erwarb einen Morris Mini 850 MK I in der Farbe Maron B über die damals bekannte Import- und Tuningfirma Wooding in Hamburg. „Wer damals mit einem Mini ernsthaft Motorsport betreiben wollte, kam nicht um Wooding herum“, erinnert sich Mengers, der seinerzeit auch einen Morris Cooper S im Slalomsport erfolgreich einsetzte. Stets getrieben von inniger Leidenschaft für den Mini und einem ausgeprägten Talent für besonders ausgeklügelte technische Lösungen, entwickelte Mengers seine Firma zum heutigen Branchen Vorzeigebetrieb. Sein Team von motivierten Spezialisten prägte ein eigenes Gütesiegel für sämtliche Arbeiten am MINI - last but not least haben bis heute nicht weniger als 6 neue, eigenständige Modelle auf Mini-Basis die Mengers Manufakturhalle in Oldenburg verlassen. Dank uns heißt es somit: Real Minis are still going strong! Über die Jahrzehnte wandelte sich der Firmenname Mini-Mengers selbst zum Markenbegriff. Der Manufakturbetrieb aus Oldenburg in Norddeutschland beteiligt sich als Innovationstreiber an der Miniwelt und somit mittlerweile einer der wenigen Mini-Spezialisten weltweit. Das Kredo: „Special Cars For Special People“ bringt es auf den Punkt. Unter finanziellen Gesichtspunkten sind Minis aus dem Hause Mengers eine sehr sehr gute Investition. Der Marktpreis entwickelt sich stetig nach oben. 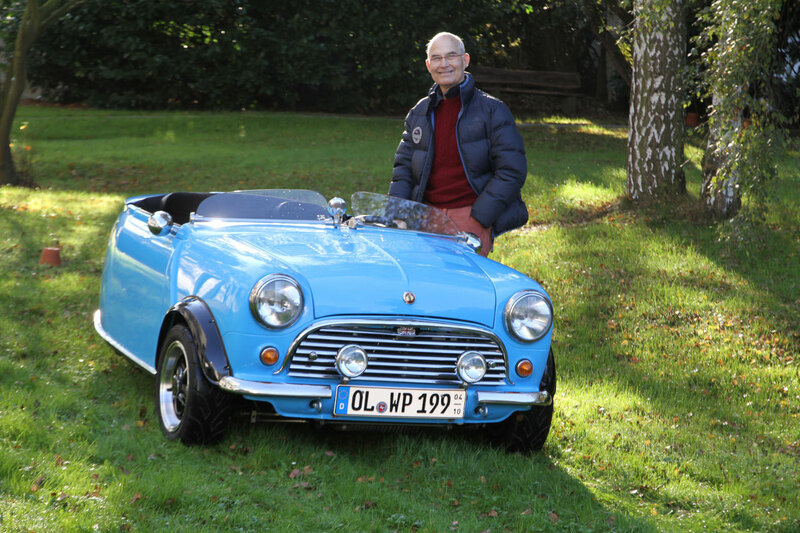 Dierk Menger’s passion for this true British icon began around 1966. At first he bought a Morris Mini 850 MK I, color Maron B, imported by Wooding, a popular tuning company from Hamburg back then. “If you were seriously enthusiastic about motor sports, there was no chance getting around Wooding”, Mengers recalls while also mentioning he loved using a Morris Cooper S for slalom races back then. Over decades his name developed to become a brandname itself. All of his special cars are reflecting the constant drive from passion and the pronounced talent for finding sophisticated technical solutions. Together with his team of highly dedicated MINI-specialists, he created a seal of approval reflecting the core values of his brand. Based on the quality promise, Mengers until this day designed six unique Mini models, all based on classic platforms. We are continuously thriving for excellence in classiness and technical sophistication. The manufactory located in the northern German city of Oldenburg (Lower Saxony) belongs to the world-class of Mini-Cooper experts. Our design approach aims towards excellence, steered by the motivation to create value. With the market prices of classic Minis steadily developing upwards, investing into one of Menger's sophisticated solutions is logical.